Pierce holes into your piece of foam and insert the earring posts. Squeeze some glue onto a napkin, and use a Q-tip to apply some to the flat part of the earring post. Firmly adhere your pearl bead, with one hole facing straight down into the stud, the other facing straight up. Use your Q-tip to apply some glue to the top hole area of the bead and press on the hot-fix stud. Pick up a rhinestone with tweezers and apply a small amount of glue to its backside using your Q-tip. Gently place it in the center of your octagon stud. Press it into place with the tweezers. Repeat for the next earring, and let dry overnight. That's it! They take only a few minutes to make and the end result is so worth it! I love how they remind me of the evil eye, but in its own way. 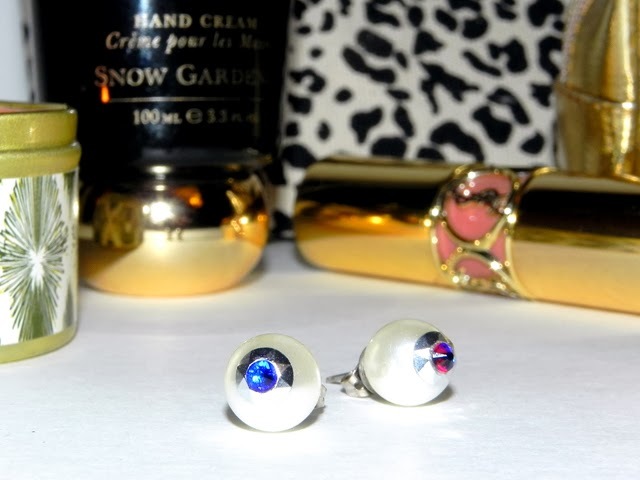 They make a statement and are much more edgy and fun than plain pearl studs. Want these? I'll be adding them to my etsy shop soon, as I have the materials to make so many! Leave me a comment if you're interested!